At a national meeting in Melbourne last week, hospital and health services from across Australia showcased their efforts to cut down on unnecessary tests and procedures that can cause harm to patients and add to health costs. 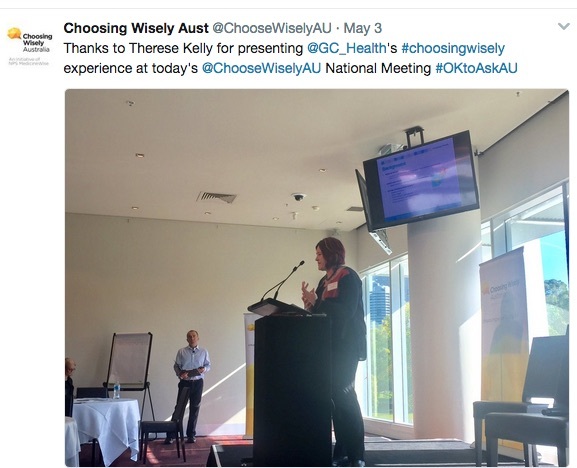 The Choosing Wisely Australia event was held by NPS MedicineWise to mark the second anniversary of the initiative in Australia that has built strong links with medical colleges and health services. It came as Choosing Wisely is set to launch its second phase, a “marathon” focus on consumers and looking to build partnerships with Primary Health Networks. 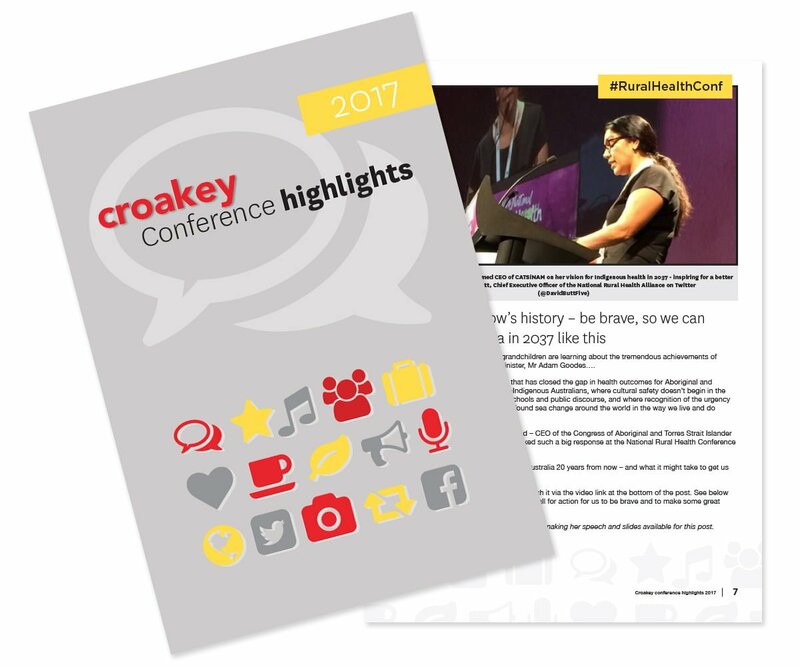 Journalist Marie McInerney attended the meeting for the Croakey Conference News Service, and reports below on a number of successful programs and the challenges still to be addressed. Bookmark the rest of her stories here, and see the bottom of the post for video interviews and tweet reports. For some health services, it’s as simple as taking a test off a default order form or adding a pop-up alert when a doctor is ordering one to ask if a patient really needs the test. 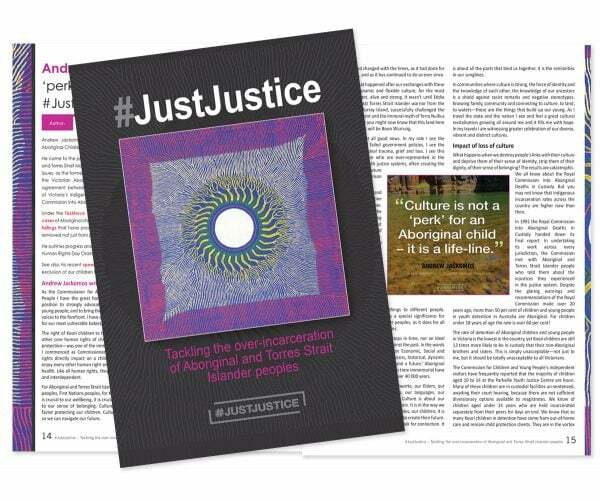 For others, it’s about deeper cultural change around patient care, addressing doctors’ fears about missing something crucial or being sued, or ambitious opportunities to cut back on patient stays by, for example, introducing same-day hernia repairs as standard in Australia. For Eastern Health, which runs seven public hospitals and a range of community health facilities in Melbourne’s eastern suburbs, introducing a program to cut unnecessary pathology tests involved a combination of factors – not least keeping it interesting and fun. 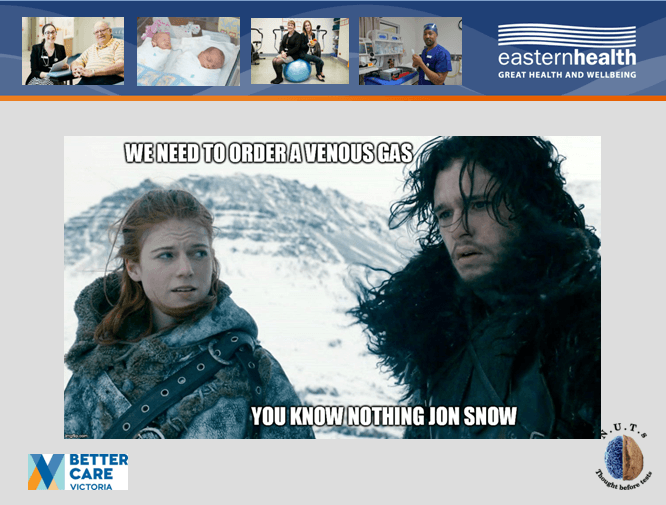 That included dubbing its Choosing Wisely style program NUTS (for “No Unnecessary Tests) and running competitions that prompted the Game of Thrones meme (feature image above) – all fun parts of serious emerging theories around ‘gamifaction’, or the use of gameplay mechanics to make non-game applications more effective. 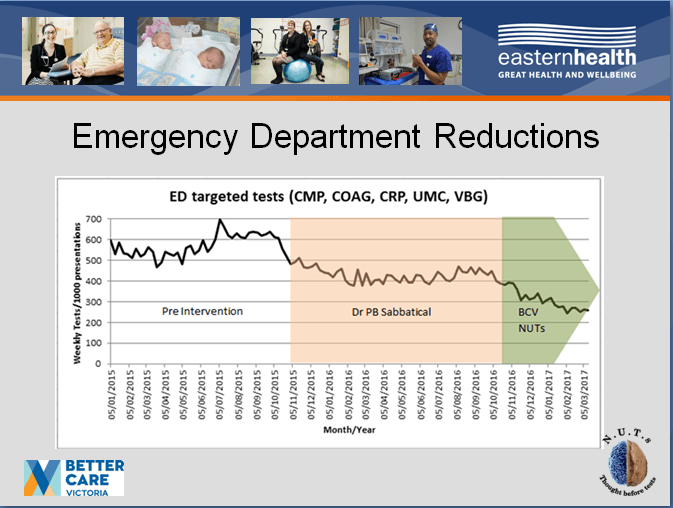 Preliminary work on the program got a big boost when emergency physician Dr Paul Buntine, who is now NUTS project leader, was granted six months sabbatical to dig into the literature around over-testing and look for patterns at Eastern Health. 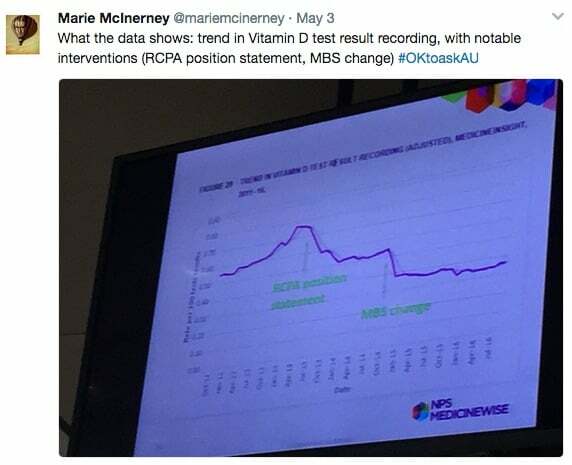 Since then the service has seen “remarkable and sustained reductions in test requesting” through education of staff, clinical pathways and electronic decision support – including an automatic prompt asking for the name of a supervising doctor when a junior doctor orders a test that has been put on a watch list. “The day we turned that on, some of the high frequency tests dropped dramatically”, Buntine told Croakey. 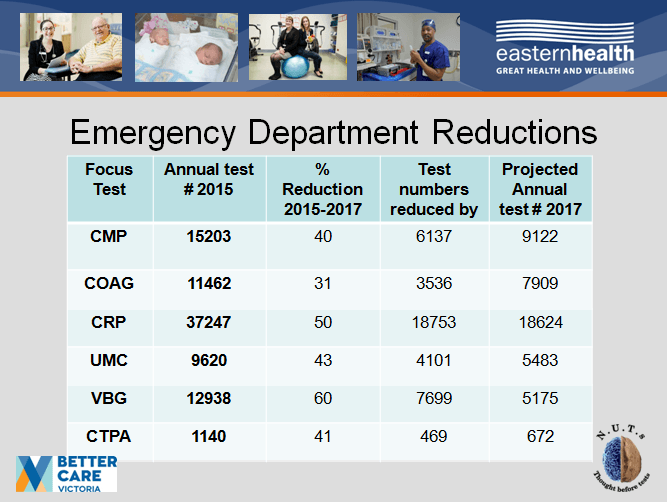 According to the NUTS presentation to the meeting, the program has delivered nearly a 50 per cent overall cut in testing – or a reduction of 40,000 tests a year – across its three Emergency Departments. It achieved that by targeting five high frequency low value pathology tests and two scans for pulmonary embolisms that are high cost, time consuming and involve considerable patient radiation exposure. 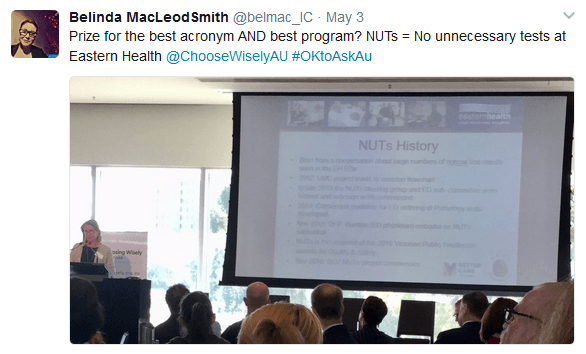 For that, the program won the 2016 Victorian Public Healthcare awards for Quality & Safety and funding now from Better Care Victoria as it expands NUTs, with similar signs of promise, into general medicine and intensive care units. “An organisational culture change is underway,” team member Janet Steele told the meeting. 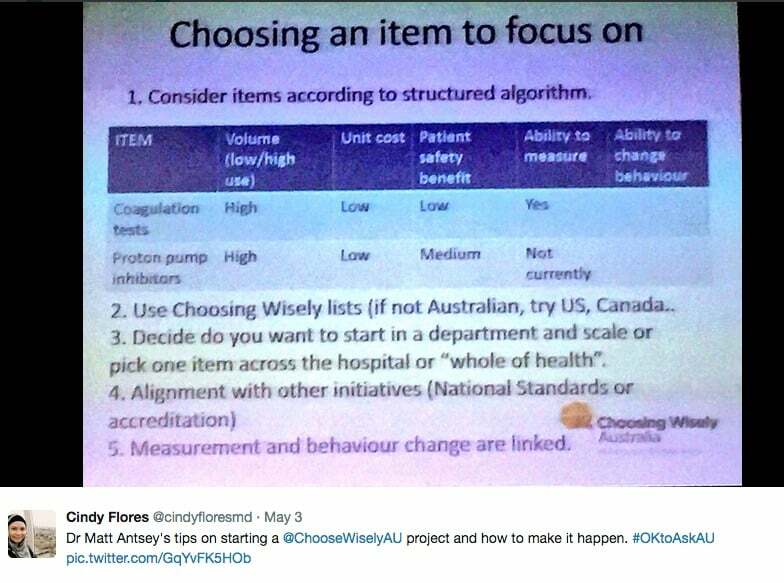 The Sir Charles Gairdner Hospital in Perth also had a catchy title for one of its Choosing Wisely programs. Emergency Department and Intensive Care physician Dr Matthew Anstey said the Bye Bye PPI program aimed to better manage the use of proton pump inhibitors (PPIs) for stress ulcer prophylaxis (SUP) in intensive care units amid concerns they are often used for long periods without ongoing review. “We did a pilot project in ICU (Intensive Care Unit) and we saw we were starting a lot of people on PPIs and then forgetting to stop them when they left ,” he said. “For us the reasons to tackle this was that it’s high volume, there’s low incidence of harm but those who do develop harm do so significantly with linkage to pneumonia, dementia and nephritis,” he said. And, he said, it was a trial looking a de-prescribing as a bigger topic. The project was informed by a retrospective study of five adult ICUs in Western Australia that found that 44 per cent of patients were discharged from hospital with a PPI with no documented indication. “This is consistent with local and international data showing a high frequency of inappropriate continuation of acid-suppressing medications,” Anstey and his fellow authors wrote last year in the journal Critical Care and Resuscitation. 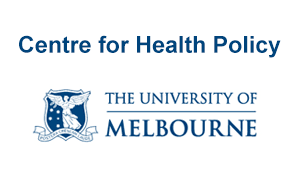 They estimated the financial costs alone of unnecessary PPI use, extrapolated across Australia, at more than $22 million a year. 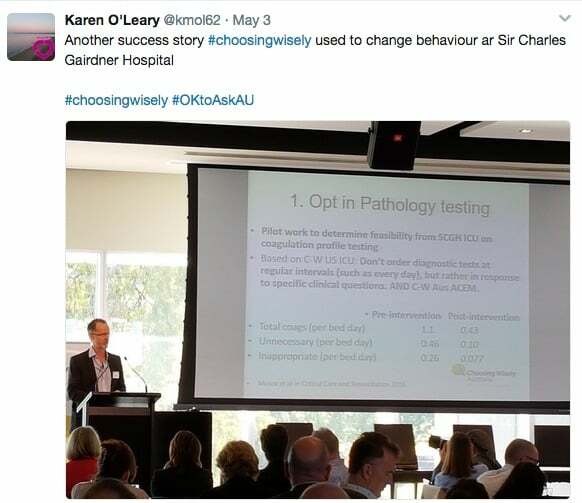 In response, said Anstey, who is chair of Choosing Wisely Australia’s Advisory Group, Bye Bye PPI took an interdisciplinary approach, involving pharmacists, junior doctors, and nurses. 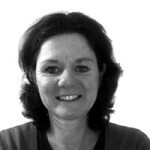 It has had a significant impact in the ICUs of the five hospitals, with unpublished results indicating a 30 per cent reduction in PPI prescribing. Anstey said results for de-prescribing were “not that amazing yet” but encouraging. The main intervention has been installing a mandatory field on the electronic discharge summary where instructions had to be written to the patient’s GP if PPI was ordered. While it can be circumvented, comments to GPs on summaries rose from zero to nearly 20 per cent. It’s not yet ideal, but better than before and is showing up some of the broader challenges. “It’s the learnings on this more than the results,” he said. As this 2012 article (by Croakey’s Melissa Sweet) explains, the forces that contribute to overdiagnosis and overtreatment include health systems that are overly focused on hospitals and specialist medicine rather than primary healthcare. Add to these legal pressures, ingrained cultural beliefs and powerful professional and commercial interests. For Choosing Wisely, the relationship between doctors and patients, and the conversations they have, are at the heart of addressing these factors. Its surveys reveal interesting insights, gaps and tensions about those relationships, including where GPs and specialists commonly say “patient expectation” is a major driver to over-testing and over-prescribing. In one survey, one in four health professionals reported that they get patient demand for unnecessary tests, treatments or procedures on a daily or weekly basis. 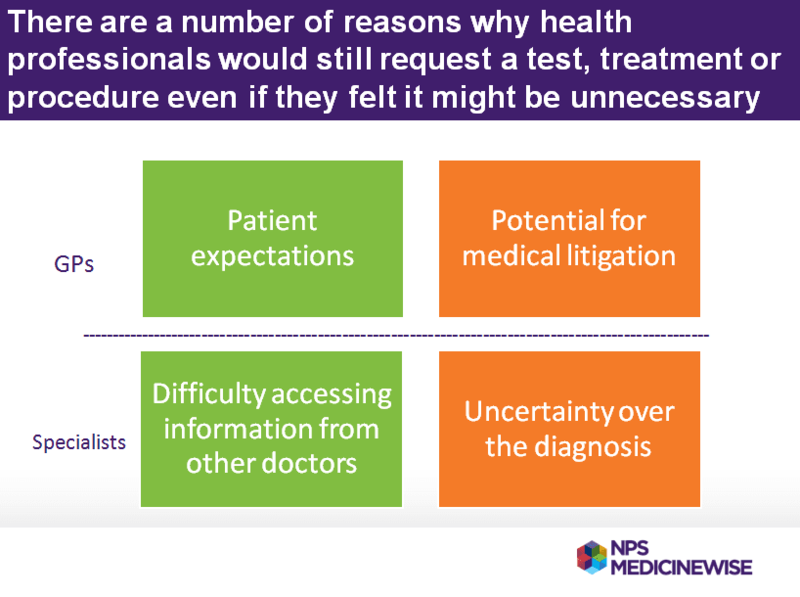 Seventy per cent of GPs in that survey reported that they always or often attempt to discourage patients from those unnecessary interventions, but they also revealed why many clinicians would still request a test, treatment or procedure even if they felt it might be unnecessary. 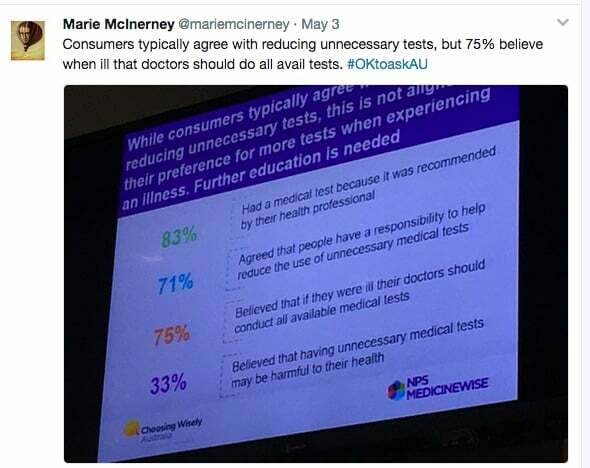 By contrast, only 16 per cent of consumers told Choosing Wisely they ask for tests and 71 per cent agreed that they have a responsibility to help reduce the use of unnecessary medical tests. However, 75 per cent then said they believed that if they were ill their doctors should conduct “all available” medical tests. 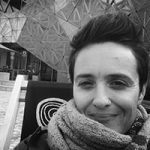 Sydney psychologist Dr Jesse Jansen provided some insights for these tensions from her project seeking to reduce the medication burden in older people. 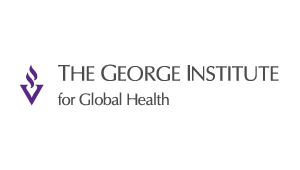 In her presentation on “Too much medicine and not enough conversation”, she described polypharmacy (taking more than five regular prescribed medicines) as one of the most important challenges in modern medicine” that increases adverse events, reduces quality of life and costs Australia up to $250 million a year. She said it seems harder to get off medication than to get onto it. 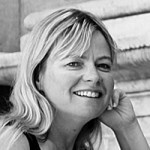 Jansen has reported on the issue in the British Medical Journal, saying there is limited evidence to inform polypharmacy in older people, but that systematic reviews of deprescribing show that “reducing specific classes of medicines may decrease adverse events and improve quality of life”. Type 1 held very positive attitudes towards medicines, preferred to leave decisions to their doctor and were resistant to deprescribing. Type 2 voiced ambivalent attitudes towards medicines, preferred a proactive role and were open to deprescribing if their medicines were causing problems. Type 3 were frail, perceived they lacked knowledge about medicines, and preferred to defer decisions to their doctor or companion. Jansen said these findings led to the development of a tool to facilitate shared decision making between the older patient, a companion or carer, pharmacist and GP about deprescribing which has shown positive results in a pilot test to date. 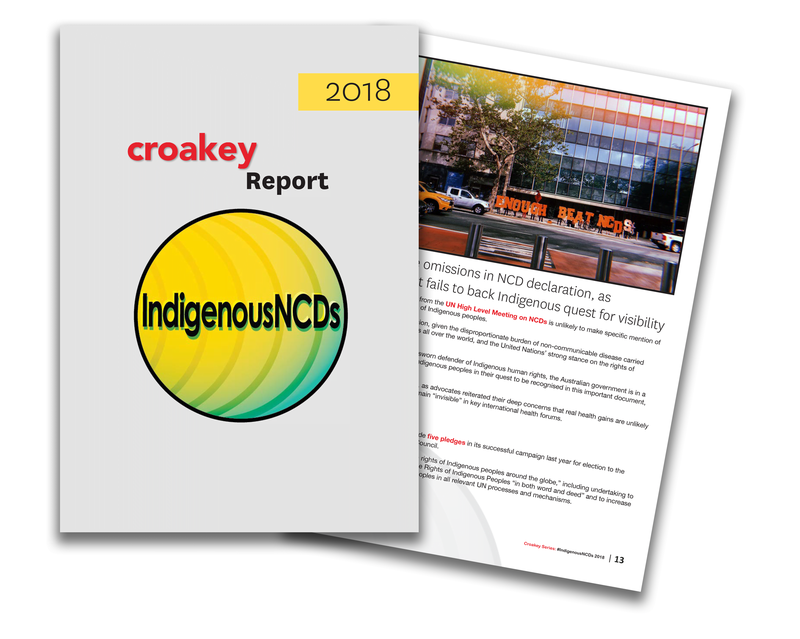 For consumer advocates, such results underscore the need for multiple strategies to engage with consumers from very different backgrounds, with different levels of health literacy access to information and support, and experiencing varying health at crucial times. 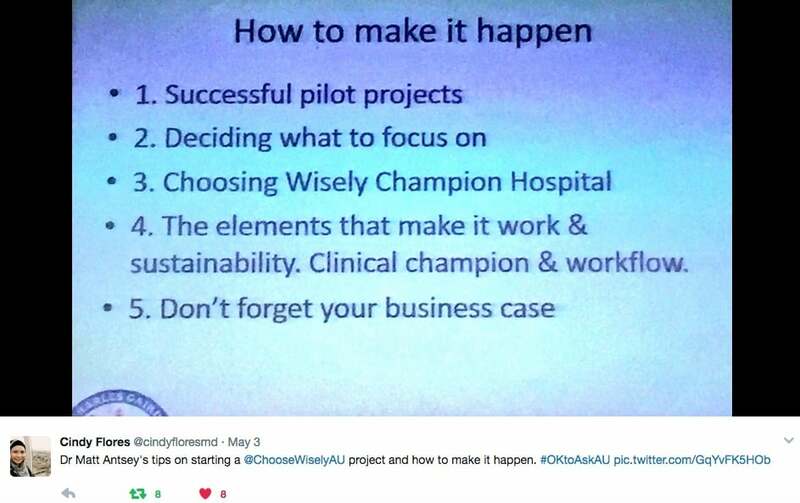 Employing a sporting analogy, NPS MedicineWise Client Relations Manager Dr Robyn Lindner said the Choosing Wisely campaign had focused initially in Australia on a “sprint” with health professionals and services, seeking to get a critical mass of medical colleges and other organisations on board and moving quickly from recommendation to implementation. 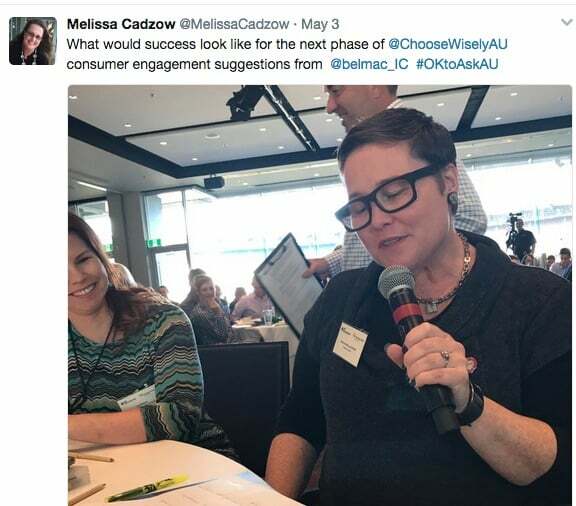 Lindner and Consumers Health Forum of Australia CEO Leanne Wells will co-chair a working group in the coming months to co-design strategies for a consumer engagement and activation project based around the highly valued Five Questions. 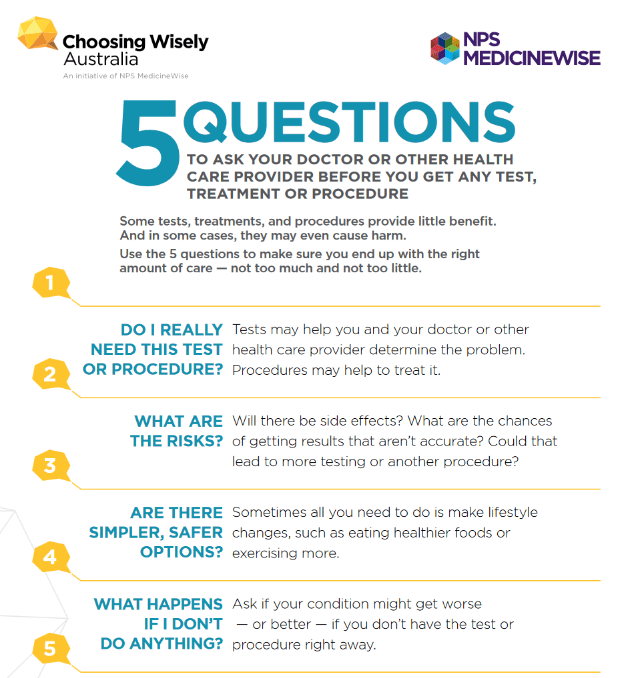 They also want to follow on from the strong relationships that Choosing Wisely has forged with eight health services that have signed up as Choosing Wisely Champions. They expect soon to announce six “vanguard” Primary Health Networks as new champions. 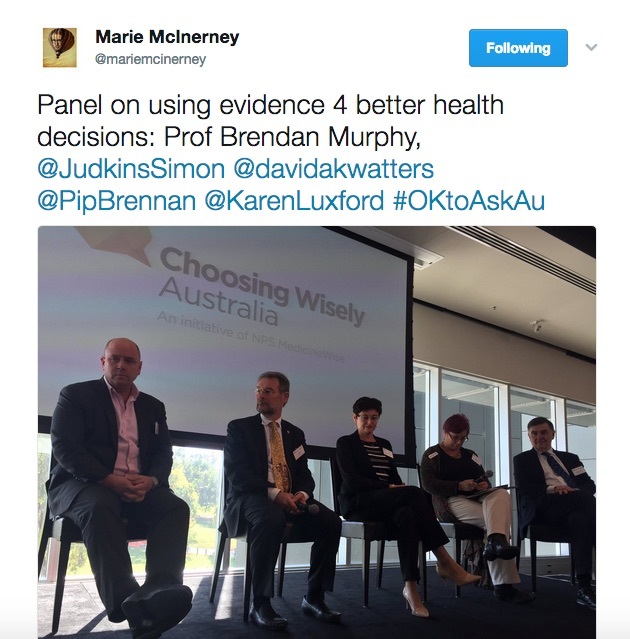 Wells was heartened by a call at the Melbourne meeting from Chief Medical Officer Professor Brendan Murphy for a “consumer movement” to be the next Choosing Wisely priority. 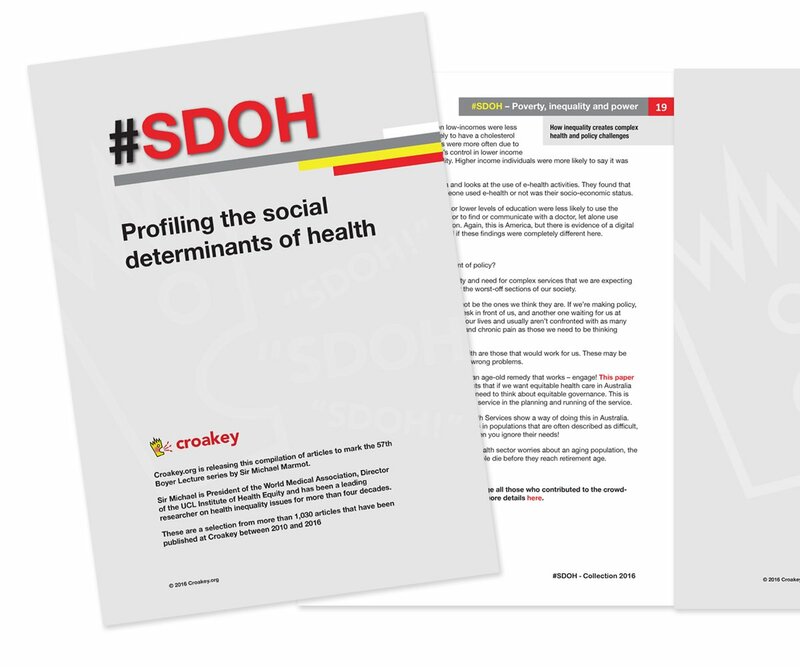 For the health profession, a number of presenters agreed on the need for Choosing Wisely to be about culture, not a strategy, and for a shift in how health professionals and services see risk and quality. 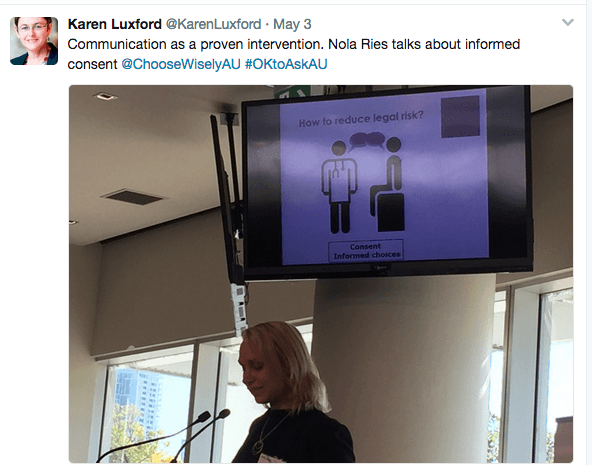 Associate Professor Nola Ries, from the University of Newcastle’s School of Law, said doctors’ fear of being sued drives unnecessary testing and treatments – with surveys showing around 70 per cent of doctors say they regularly engage in defensive practice. “This means doctors order tests and procedures, make referrals, and prescribe drugs to reduce perceived legal risks, rather than to advance patient care,” she said. 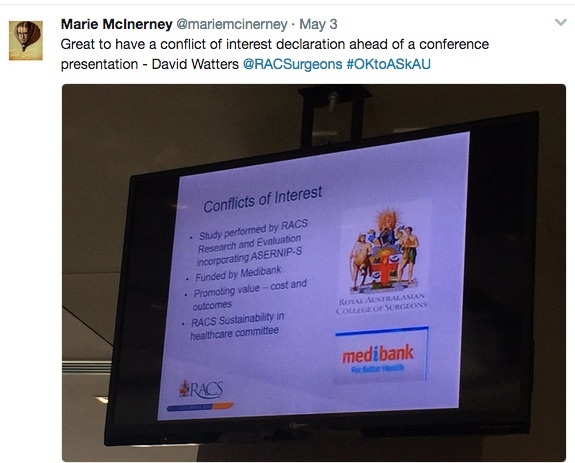 But she said her review of Australian legal cases shows many doctors misunderstand their legal risks on two levels. First they worry about being sued if they miss a diagnosis or treatment is delayed, when Australian courts actually discourage defensive practices. Secondly, the legal principle of consent means that patients have a right to make informed healthcare choices. “Yet research reveals that many doctors do not adequately inform their patients, especially about the risks of overdiagnosis and overtreatment,” she said. It’s also about changing the way doctors and health care services judge quality of care, said Dr Simon Judkins, president-elect of the Australasian College for Emergency Medicine. 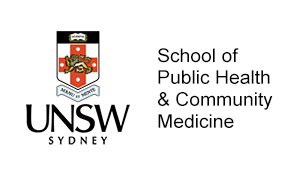 He referred to a recent article published in Emergency Medicine Australasia by Professor Gerben Keijzers that urges “critical thinking, curiosity and parsimony” in medicine and suggests ‘doing nothing’ could be redefined as a quality measure. 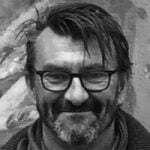 “It is important to remember, more care is not better care,” Keijzers writes. 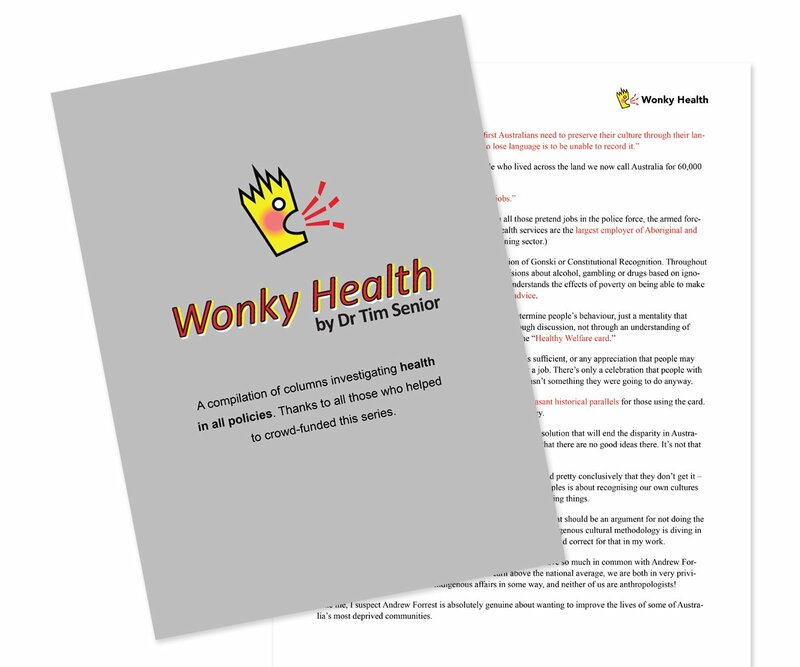 But, with Choosing Wisely initiatives delivering many financial savings, there was also a warning that policy makers and regulators should “venture carefully” and make sure that improved patient care remains the driver, not containing costs. 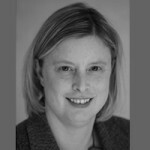 Dr Karen Luxford, from New South Wales’ Clinical Excellence Commission, said that pulling the wrong kinds of levers and mechanisms could end up with perverse incentives. 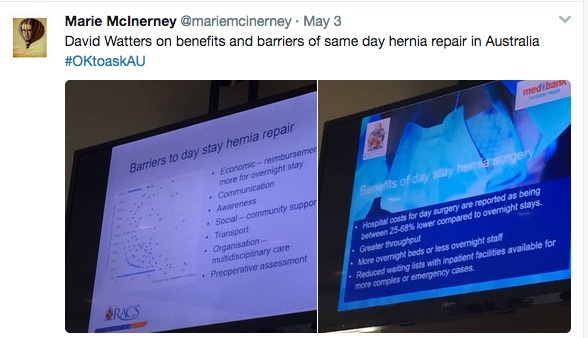 She recalled the decision by Medicare in the United States in 2009 to stop reimbursing hospitals for several complications or comorbidities developed during hospitalisations – described as ‘never events’ (events that should never happen). Such regulations, she said, “can lead to gaming and people and hospitals not accepting patients that might get them into that category”.